Period House Store offers a wide selection of both internal and external traditional oak and pitch pine doors. From simple oak cottage doors to elegant Victorian townhouse doors, our range covers all angles. 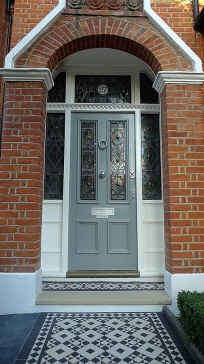 Many of our doors are handmade and can be made to measure. We can make any door, so if you have a door you require all we need is a picture and some dimensions and we can provide you with a quotation. Period House Store offers a wide selection of oak doors in both standard sizes and made to measure. All our timber is kiln dried to ensure stability. Our internal doors include ledged and braced, traditional four and six panel and the more contemporary Oak Mexicano. We also have several oak fire doors with FD30 certification. We have a wide selection of traditional door furniture to compliment our oak doors from hand forged ironmongery manufactured by From the Anvil to more intricate brass and nickel door knobs for the panelled doors.